The majority of goods moved via road and sea transport are normally palletised before leaving the warehouse. The two most common types of pallet used within the shipping industry are the standard pallet and the euro pallet. The height of each pallet will vary depending on the goods being moved, and this will also determine the overall cubic volume of the cargo. Quite often when calculating the price of an export or import job, the haulier will determine the rate based on the amount of space the goods take up within their trailer – this is referred to as “Loading Metres”. As the width of the trailer is 2.4m, it is possible to load 2 x standard pallets (1m long x 1.2m wide), side by side across the width of the trailer; 2 x 1.2m = 2.4m. The two pallets will measure 1m down the length of the trailer, so combined, these two pallets will equal 1 Loading Metre, or 1LDM (sometimes referred to as 1 x Deck). When it comes to euro pallets, these can be loaded on to the trailer in two ways. Alternatively, 3 x euro pallets will fit side by side across the width of the trailer; 3 x 0.8m = 2.4m. The three pallets will measure 1.2m down the length of the trailer, so combined, the three pallets will equal 1.2 Loading Metres (1.2LDM). The haulier will load the trailer so as to maximise the space available to them, while ensuring that it is safe, and the risk of goods being damaged during transit is minimised. The rate or price for moving cargo is more often than not, based on the “chargeable weight” of the goods being moved. This can either be the gross weight of the goods themselves, or the weight based on the cubic volume of the goods – whichever is the greater of the two. For example, a company in Belfast, Northern Ireland, is looking to export a pallet of “spare parts” from their factory, to a customer based in Gothenburg, Sweden. 1m (L) x 1.20m (W) x 1.5m (H). Therefore, in this instance, the customer will be charged based on 600kg as this is the greater of the two amounts. When it comes to transporting dangerous goods, there are certain rules around how these should be packaged and labelled appropriately, and this is determined by their class. It is the responsibility of the sender for classifying, packaging and marking the goods being shipped. For more information on hazardous goods, including the various classes, please click here. Depending on the volume and nature of the goods you need to ship, will determine whether or not it is more cost-effective to move the goods as groupage or as a full load. Sometimes referred to as consolidation or less-than-container (LCL) loads, this involves bringing together individual consignments using a simplified rate structure, and is often more financially beneficial as shippers with small quantities of cargo can benefit from lower rates thanks to economies of scale created from grouping small consignments together. This is when the volume of cargo is large enough to merit a single complete unit of carriage for the goods in question. On occasion, this can be the most cost effective solution, even if the goods do not use up the entire space available within the trailer/container. The curtain-sided trailer has a flat-bed floor, road end doors, a fixed rigid roof and PVC curtains suspended from the roof, that can be drawn back to enable side-loading. Curtain-sided trailers are particularly useful for palletised traffic. 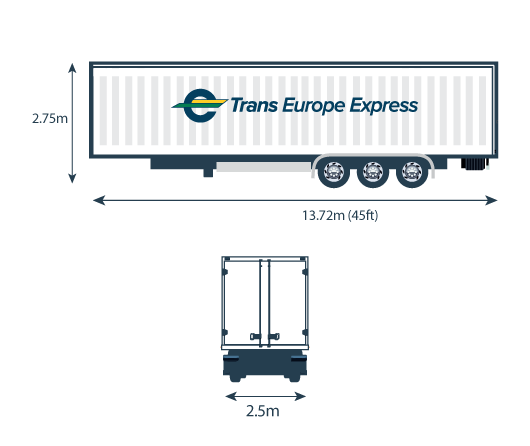 The internal dimensions of the most common curtain-sided trailers are: 13.6m long x 2.4m wide x 2.5m high. A high-curtain side trailer can be up to 3m in height. The flat-bed trailer has the obvious advantage of flexible loading options as there is no roof or sides to navigate around, although this also means that cargo is more exposed to bad weather conditions, and there is a greater risk from a security perspective also. Ideal for large pieces of machinery, the flatbed trailer is normally 12m in length and 2.5m wide. The most commonly used container within the European market is the 45ft HCPW (High Cube Pallet Wide). The two most popular types of container used within the deep-sea shipping industry, that is, to and from markets outside Europe, are the 20ft and 40ft containers, and as with most containers, are generally built to International Standards Organisations (ISO) specifications. The type of container you require will be determined by the type of cargo to be moved, the size and volume of the cargo, where it is being shipped to, and the transit time required. Other than goods moving within the EU, customs clearance remains a requirement, for exports and imports, as does the payment, administration and control of duties and taxes. Preparation of customs entries and knowledge of Customs procedures has long been a freight forwarder speciality, and there are other aspects of control and reporting – even for trade within the EU which benefit from the input of expert knowledge. Forwarders have invested heavily in electronic links to H M Customs in recent years, and this enhances the speed of processing of goods through UK ports. The EU in particular is going through a revolution in Customs controls in the way that Customs authorities worldwide approach facilitation. Today the security of cargo in the transport chain is a major concern and security processes are now linked to Customs controls. Those forwarders who are Authorised Economic Operators (AEO) have invested in training, software and hardware to ensure that their customers goods not hindered as they move through the transport chain. International trading cannot be regarded as a mere extension to domestic goods in transit policies and it should not be assumed that carrier liability will cover the full cost of the goods lost or damaged. Traders will want the assurance that they are covered from door-to-door and not just on one specific leg of the journey. As part of the commercial transaction, the freight forwarder can act as an insurance agent and will advise on and arrange the most appropriate method of cover while providing the insurer with details of transit risks or trans-shipment. ampills.com. It is possible that Insurers may also require declarations to cover delays in transit or extensions to normal policies to cover packing and security. Are you new to the world of freight, logistics and shipping? Want expert advice and a competitive quote? Contact us, we’d be delighted to help you through the process. Get in touch.